Thailand is in Asia continent. It is between China and Indonesia. Thailand has 76 provinces. The capital of Thailand is Bangkok. Thailand has 3 seasons. There are Summer - March to May, Rainy - June to October and Winter - November to February. In Thailand has 6 parts. It has the North, the central part, the West, the East, the Northeast and the South. The North has 9 provinces. They are: Chiang Rai, Chiang Mai, Nan, Phayao, Phrae, Mae Hong Son, Lampang, Lamphoon and Uttaradit. The Central has 22 provinces. They are: Kampangphet, Nakhorn Sawan, Phichit, Phitsanuloke, Phetchaboon, Sukhothai,UthaiThai Thani, Bangkok, Chainat, Nakorn Nayok, Nakorn Pathom, Nonthaburee, Pathum Thani, Pranakhorn Sri Ayuttaya, Lopburi, Samut Prakarn, Samut Songkhram, Samut Sakhorn, Saraburi, Singburi, Suphanburi and Ang Thong. The West has 5 provinces. 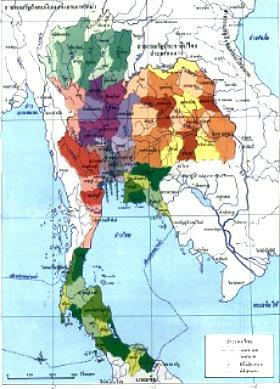 They are: Kanchanaburi, Tak, Phetburi, Ratchaburi and Prachuap Khirikhan. The East has 6 provinces. They are: Chantaburi, Chachoeng Sao, Chonburi, Trad, Prathinburi and Rayong. The Northeast has 17 provinces. They are: Kalasin, Khon Kan, Chaiyaphoom, Nakhorn Phanom, Nakhorn Ratchasima, Nong Khai, Buriram, Mahasarakham, Mukdaharn, Yasothon, Roi Et, Loei, Sri Saket, Sakon Nakhorn, Sorin, Udon Thani and Ubon Ratchathani. The South has 14 provinces. They are: chumphon, Trang, Nakhorn Sri Thammarat, Narathiwat, Pattani, Phang Nga, Phattalung, Phuket, Yala, Ranong, Songkhla, Satoon and Surattani.